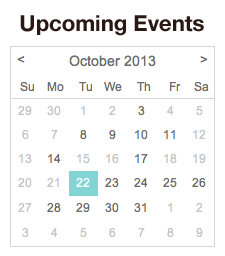 The Tiny Calendar Widget allows you to embed a small version of your Evanced Events calendar on your web page. The month label links to the full version of the calendar. The number for each day links to that date's events. Start by downloading the code from the attachment below this article by right-clicking the link then selecting to Save Target on your PC. Open the source code of the attached file and make the adjustments indicated below. where the red text matches your site URL. You can then install the widget on your your library's home page. Testing the TinyCal.html page locally currently only works in Firefox. Please note that Evanced's support is limited to the functionality of the TinyCal widget and the way it looks independently. Evanced does not provide support for installing the widget on your site, nor does it provide support for the widget's design after installation on your site. Summary: Instructions for downloading and configuring the TinyCal widget for SignUp. Posted - Fri, Aug 16, 2013 at 10:01 AM. This article has been viewed 5882 times.